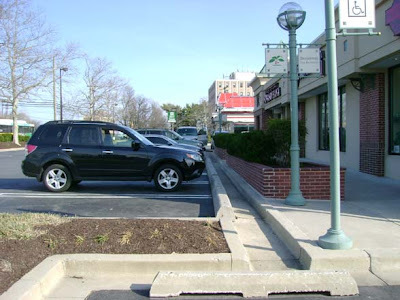 Another great example of how a shopping environment can keep cars and people safely separated can be seen at Wintergreen Plaza in Rockville, Maryland. 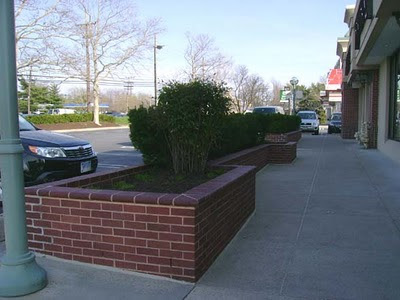 Robust red-brick planters with evergreen foliage not only serve as barriers, they also provide visual separation between asphalt parking lots and brand-specific storefronts. Note also the heavy duty concrete 'bumper' in each parking space. Want to sit in the seats right by the window at the Starbucks or Chipotle? No worries. In fact, I would bet that most patrons are not even consciously aware of being safer. Speaking from personal experience as a frequent visitor to this center, you just feel more secure in these stores and restaurants.